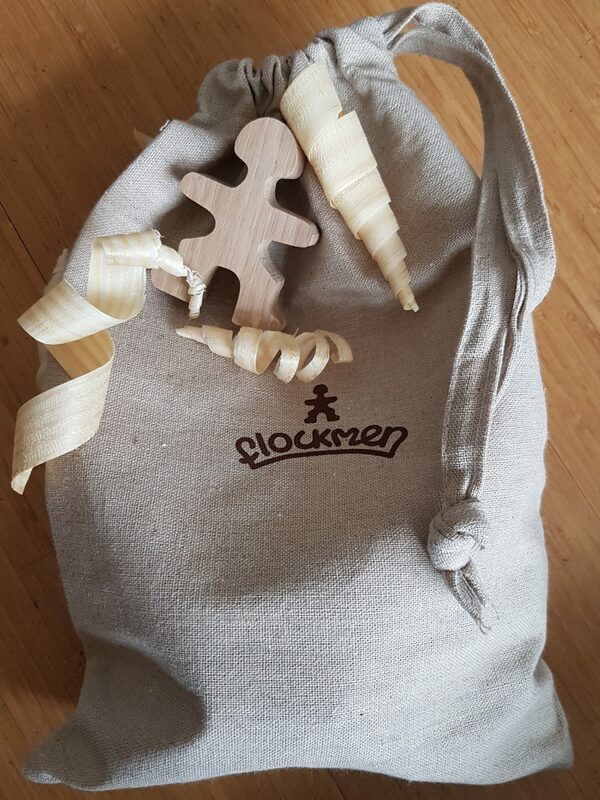 Following my blog post on why we prefer our children to play with wooden toys (if possible), a lot of people have been asking us questions about our set of Flockmen. So who are Flockmen exactly and what can you do with them? I always love to read or hear the story behind a product. Kris and John founded Flockmen in an attempt to bring play and fun back into their lives. With Flockmen, they wanted to create a product that everyone in the family could play with. And that’s exactly what happens with us – I too get on the floor together with my children and play with our set. It’s fair to say that I love these toys as much as our boys do, and watching them come up with their own initiatives and ideas when they take them out of the bag is just fantastic. Flockmen are open-ended and allow for exploration and fun and are really appropriate for whatever age or stage your child is at. So if you have a set of Flockmen or are considering getting one, here are some of the things you can do with them. Head over to their website to download outlines that your child can try and fill in with Flockmen. The idea is to re-create the same shape shown on the card. 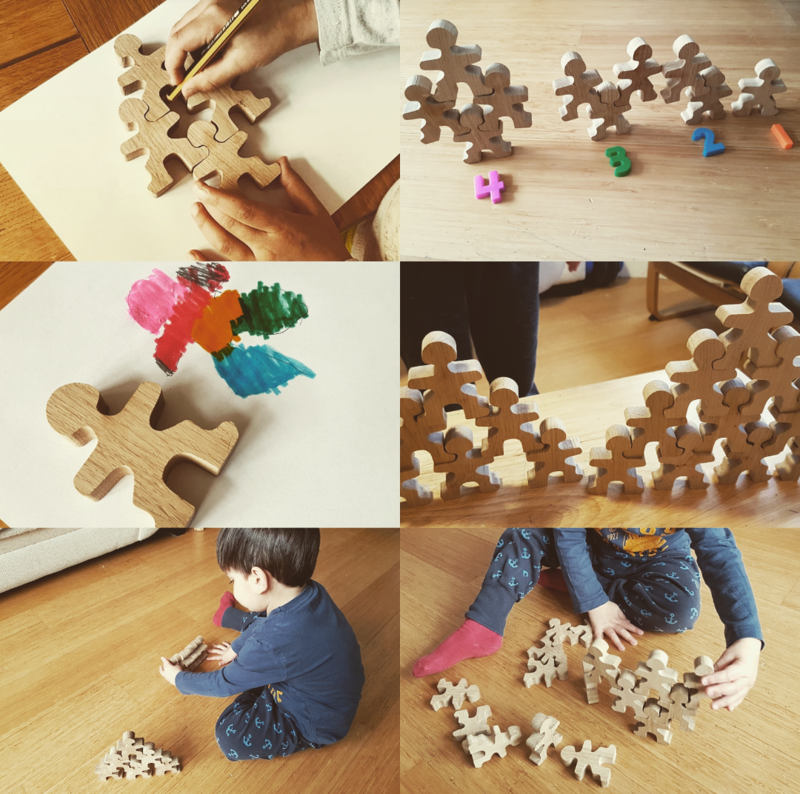 With only the outline provided, your child needs to work out how many wooden toys they need and how they need to organise them to replicate the pattern shown on the card. That’s problem-solving in action for you. Or you can do the reverse of that – my son decided to organise a few Flockmen on a piece of paper and trace around them. And then to colour them in! It was completely his idea, and I love how he came up with that. 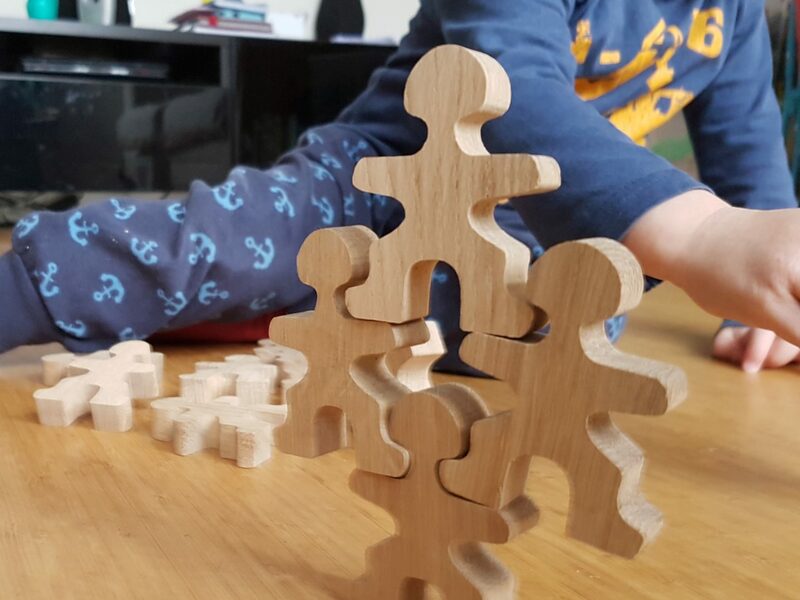 By far our favourite game, this is all about organising the little Flockmen in towers and shapes to make them stand together. It’s of course harder for the younger ones, but great for the older ones and adults alike. My youngest, who’s 2 and a half, loves putting them in a row instead of on top of each other. His fine motor skills aren’t quite as developed yet to allow him to balance them out successfully. But he does try. And of course this is great for his hand / eye coordination and for tuning his fine motor skills in. Flockmen aren’t just wooden toys – they’re little people! So it makes sense to give them clothes! On their website you can find downloadable cards that show Flockmen wearing tops and trousers. 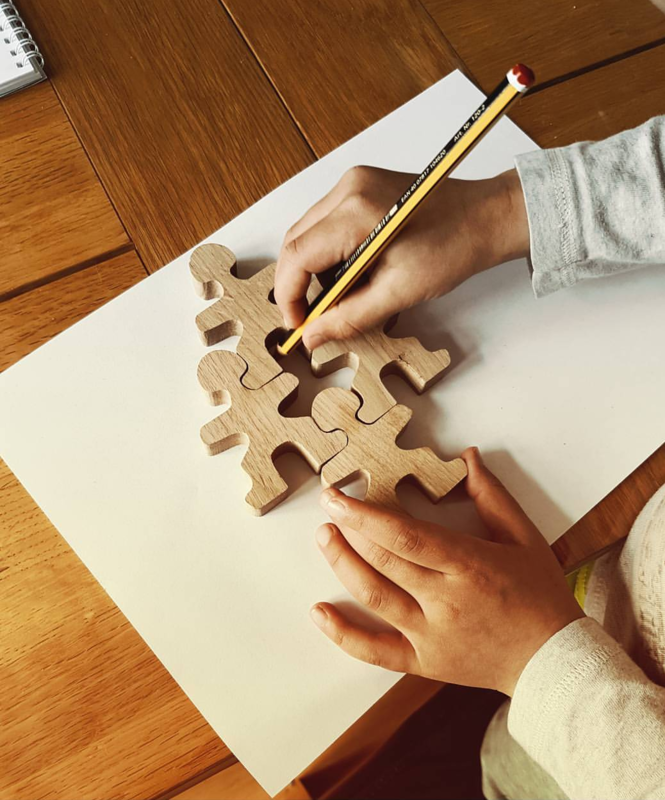 You and your child can then try and replicate the outfits by painting on them, dressing them in felt or wool (all ideas and suggestions provided on the website), or simply by cutting out the clothes and sticking them on. We haven’t tried this one yet, as my boys don’t want to do anything ‘permanent’ to their little Flockmen. But they’ve given me the task to get them some wool, so they can dress their little friends for the winter. That’s right – if you can have little wooden people in an outfit, why not make it all a little bit more sophisticated and turn them into a pirate, a teacher, a police officer or a fire fighter?! 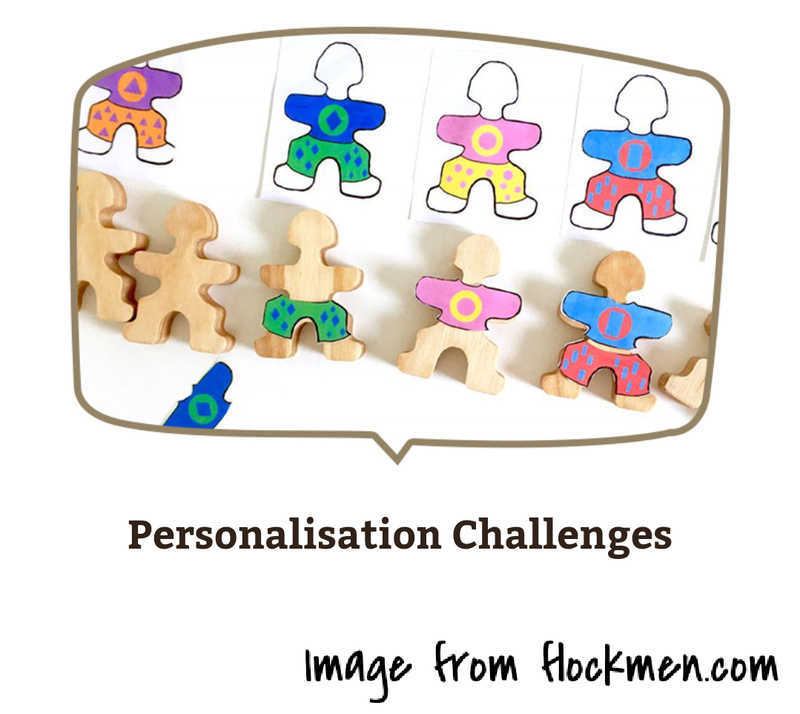 If you have a specific request for a personalised set of Flockmen, you can get in touch directly via hello@flockmen.com and find out whether your wishes can come true. But if you want to ’embellish’ your Flockmen set, personalised stickers will be available on sale on the website soon. And with those, you and your child can take imaginative and role play to the next level. Something that my 5-year-old did is to organise our Flockmen into little sets (of 1, 2, 3 or 4 toys) and then put a number against them. I loved this idea he had! 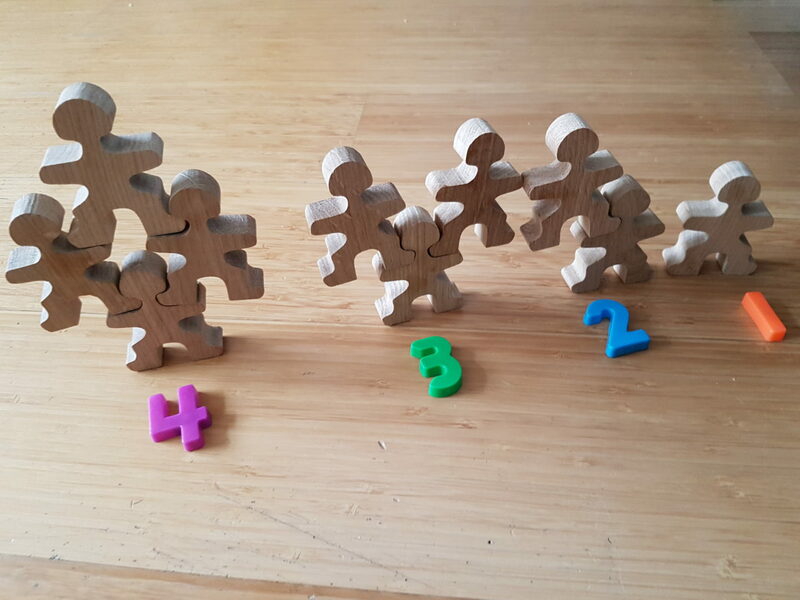 On the Flockmen website you can find more suggestions to use these little people for counting and strengthening your child’s numeracy skills, however old they are. You can even use them to demonstrate to your child how ‘more / less than’ or addition and subtraction work. If you are considering getting a set of Flockmen, you can head over to their website – Flockmen are sold in sets of 16, 32 or 100 (recommended for schools). Do you like the look of Flockmen? Would you consider getting a set? Or if you have one, how do you and your children like playing with them? *We received a free set of Flockmen for the purpose of this review, but all opinions expressed in this post are my own. Please note that this post contains affiliate links.